For over 50 years, Pioneer Telephone Cooperative has provided telephone service to communities from the Willamette Valley to the Central Oregon Coast. 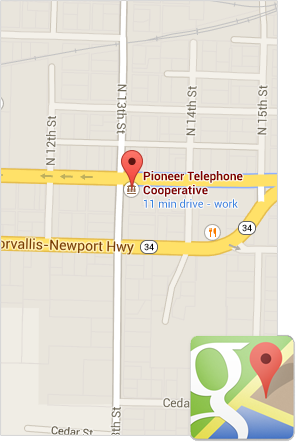 We are proud that Pioneer is recognized as a leader in Oregon′s telecommunications industry. We have invested in our network infrastructure, which in turn, has allowed us to provide advanced services to our members. With our well-trained, enthusiastic workforce and focused strategic plans, Pioneer is positioned to bring its members the broadband technologies that the near future holds. Our commitment to technological growth is only surpassed by our commitment to excellent customer service. Our employees continuously strive to strengthen member relationships by ensuring that their communications needs are met. We also maintain a strong local presence, with two offices to serve you, conveniently located in Waldport and Philomath. Oregon′s telecommunications industry. We have invested in our network infrastructure, which in turn, has allowed us to provide advanced services to our members. With our well-trained, enthusiastic workforce and focused strategic plans, Pioneer is positioned to bring its members the broadband technologies that the near future holds.